Most everyone has an opinion on whether or not our boys look like each other- some say yes, some say no… does this help in making a decision? Both sets of photos were taken when Jay and Charlie are 3 months old to the day. 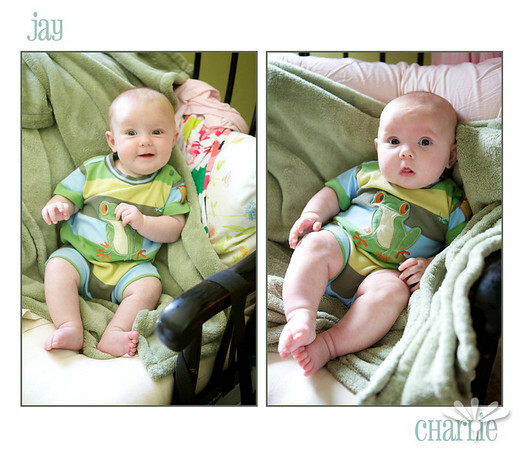 On a whim, I choose to put Charlie in the same outfit that I took Jay’s photos in and boy am I glad that I did- it has been so much fun to see the photos side by side! I only wish that Charlie had been a little more smily on the day of his photos… if he was I think the photos would have been even more similar! No question that they are brothers, but I do see differences. Charlie has larger eyes and a little difference in the shape of his face. The little differences are what make having siblings so interesting…we are after all, all unique. You are blessed! Oh wow, I didn’t think they looked alike at all until I saw these! I definitely see it now. 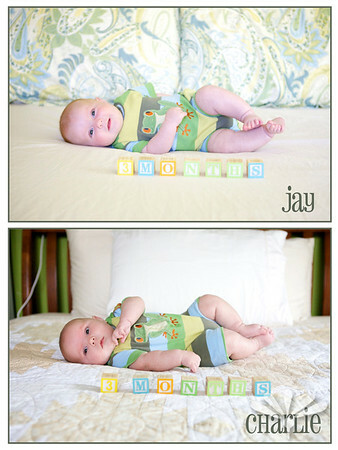 How fun it will be to watch these two boys grow and see their similarities and differences. They are both beautiful boys that’s for sure! !